We were travelling all day: through the exotic strangeness of the Zanzibar Stone Town to the Nairobi airport’s thick mess of people and suitcases, sickening smells and deafening noises. Then again, through the traffic and dust and darkness of Nairobi streets, until all of sudden, like a mirage in the wilderness, we saw a brilliantly lit Jewish star. 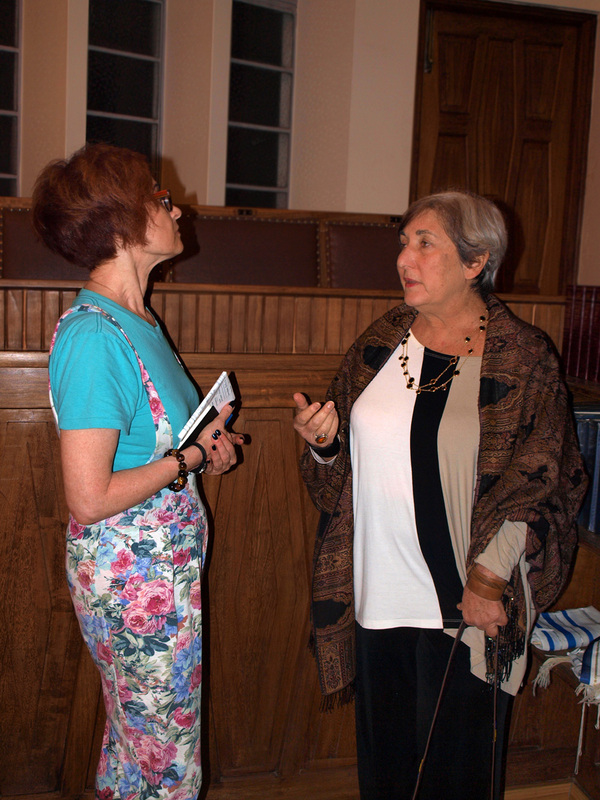 “Are you meeting with Barbara?” a voice asked. We were. Barbara gave us a detailed tour. I had read the book she sent me about the history of the congregation and I studied the synagogue’s website. But to step into that beautiful building, live, was entirely different. 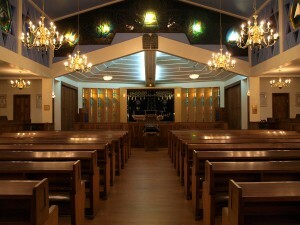 There was something in the main sanctuary’s colors of warm wood, bright blue and gold that warmed a heart. I could not believe that here we were, in the shul right in the heart of African darkness, but it felt so familiar at the same time. I am an art and travel writer and my husband Alex is a photographer. We have been traveling the world together for over 30 years, ever-attuned to the Jewish story that, more often than not, seemed to be an endless chain of persecutions, humiliations, mass murders: from century to century, from country to country. When we went to Africa, our friends joked: “It would be a challenge to find your Jewish story among the wildebeests!” Don’t you doubt, I said, you’ll see. I’ll find a happy one. Barbara treated us to a delicious fruit cake and coffee. We met the synagogue’s facility manager, a delightful Kenyan, Aggrey Muchene. 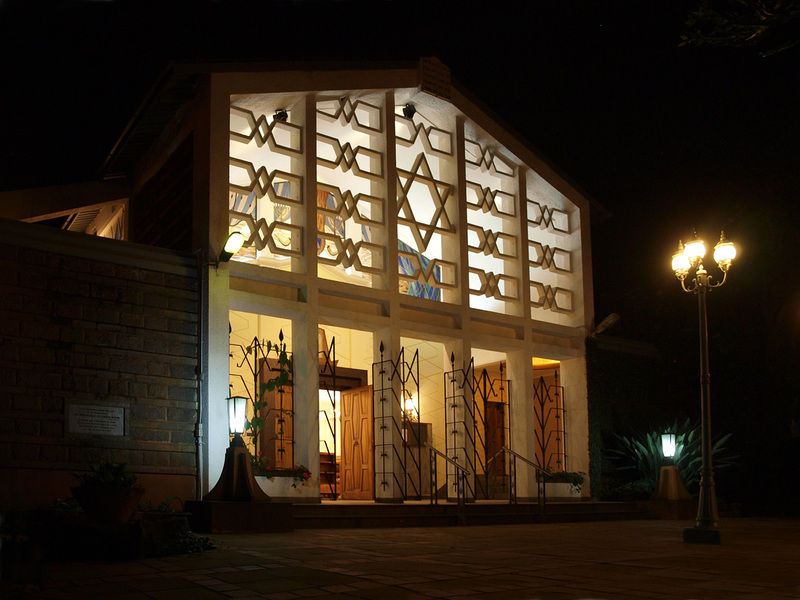 Two travelers from Cleveland, Ohio, a Kenyan from a neighboring village, and a lady from Baltimore – we talked about difficult life in Kenya and our families, the recent devastating fire in the airport and this beautiful synagogue. I thought about the meaning of Jewish identity: expansive and inclusive, it may stretch much beyond what we think of as Ashkenazi or Sephardic. What is Jewish Diaspora? I asked myself. Could it be simply defined as a removal from one’s homeland? There is something in us, Jews, I thought, a truly eternal people, that moves us, no matter where we are, to always create a space of cultural solidarity and expression of community. A home away from home. This entry was posted in Africa, Jewish Story, Travel Photography and tagged Africa, jewish, travel. Bookmark the permalink.